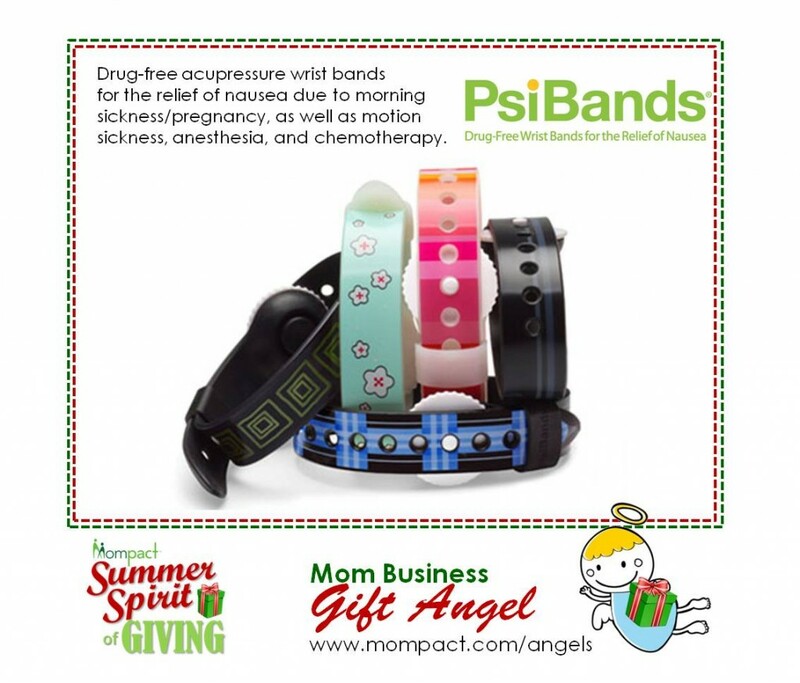 Psi Bands are drug-free acupressure wrist bands for the relief of nausea due to morning sickness/pregnancy, as well as motion sickness, anesthesia, and chemotherapy. Picture this: Pregnant woman (me) hugging the “porcelain God” because I had terrible morning sickness (and whoever named it “morning” sickness clearly did not realize that it can – and does – last ALL day!). Retail Distribution: Psi Bands are sold in more than 10,000 US locations, including: CVS, Target, Babies “R” Us, Whole Foods, REI, AAA, Amazon, etc. They are also sold in hospitals, hospital gift shops, and wellness centers. Taking matters into my own hands: I suffered from debilitating morning sickness during my pregnancies, and eventually discovered the benefits of acupressure wrist bands to relieve my nausea. However, I was dissatisfied with existing products on the market that were drab (look like sweat bands); not waterproof so I could not wear them in the shower or else they would get water logged; and they would stretch out over time so they would not stay static on the Nei-Kuan acupressure point clinically proven to relieve nausea. So I gave birth to a new product, Psi Bands — fashionable and functional acupressure wrist bands for those who suffer from nausea. A product is born: FDA-cleared Psi Bands, a medical device, are the only stylish drug-free wristbands for the relief of nausea caused by morning sickness, motion sickness, chemotherapy and anesthesia. Double blind randomized studies support the use of wrist acupressure in the relief of nausea. They provide consumers with a drug-free option that does not interfere with other medications and does not cause dry mouth or drowsiness, which are common complaints about the drug options on the market. Psi Bands are uniquely fashionable (available in several fashion-forward colors) and functional. They are: 1) waterproof – no more soggy wrist bands so you can wear them in the shower, snorkeling, or swimming; 2) adjustable around the circumference of the wrist and at the acupressure point for personalized comfort and fit so they stay static on the acupressure point, the point clinically proven to relieve nausea; 3) reusable; and 4) affordable. Now, those who suffer with nausea can breathe a “psi” of relief! • 80% of pregnant women suffer from morning sickness and there are 6M annual pregnancies in the US. • The #1 most dreaded side effect of chemotherapy is nausea and vomiting. That’s a whole lot of people suffering from nausea! Educating them that there is a drug-free, clinically proven option to relieve there nausea is a key to their wellness.